People seem to fall in love-and out of love-with everything from their cars to their mates. With the world's distorted view of love, it's no wonder some Christians can't recognize godly love when they see it. God's love letter to us is 1 Corinthians 13, and it contains some of the most inspiring and practical teaching on love that the world has ever known. A Love That Never Fails will help believers see God's changeless love clearly and pass it along to others. We hear a lot about love. People claim to fall in (and out of) love with everything from their cars to their mates. Yet every other magazine on the newsstand carries an article asking, 'What is true love? 'You need look no further than God's Word for a definition of true love. First Corinthians 13 is known as the 'love chapter,' and in it is God's definition of what it means to love Him and those around us.Are you longing to see God's love more clearly? Do you wonder sometimes how true love is expressed? Has your love for God and for the people He has put in your life grown cold? God's love letter is for you.Walk with Dale Burke through 1 Corinthians 13 and let the the apostle Paul's words guide you into a more intimate relationship with the Lord of love and more fulfilling relationships with your family and others. And if they sound familiar, don't worry. The last time you read or heard them, you probably didn't realize they were written to you. 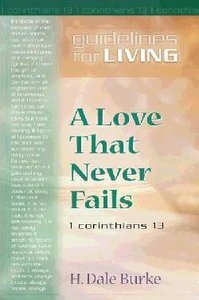 About "Guidelines For Living - Love That Never Fails (Guidelines For Living Series)"
Burke is the senior pastor of First Evangelical Free Church of Fullerton.